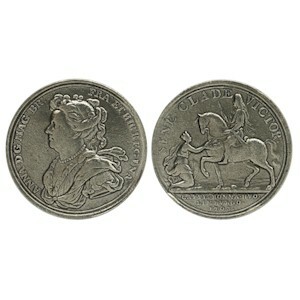 Obverse: Bust of Queen Anne, the reigning Queen. Text around ANNA D.G. MAG BR FRA ET HIR REGINA. Reverse: The 'spirit' of Guelderland is represented, kneeling before the Duke on horseback and holding up to him the keys of the captured towns of Bonn, Huy and Limburg. Text above SINE CLADE VICTOR. Text Below CAPIS BONNA HVO LIMBVRGO 1703. History: This medal has been cast directly from the original held at Blenheim Palace after the Duke of Marlborough himself gave permission for a cast to be taken. The medal was struck in 1703 and commemorates the achievement of John Churchill, Duke of Marlborough in besieging and capturing the fortified towns of Bonn, Huy and Limburg in the province of Gelderland (Spanish Netherlands) that year.